York House in Hudswell, near Richmond sleeps 10 people. 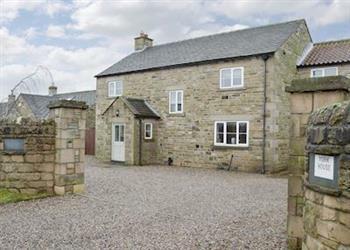 York House near Richmond is a beautiful stone-built, detached house, adjacent to the owners’ home, in the picturesque Swaledale village of Hudswell. Built by the owner to a good standard, with many contemporary fixtures and fittings. The living room boasts a wood burner, and there’s also a large, well-equipped kitchen/dining room, a cosy snug, plus five comfortable bedrooms, some with en-suite facilities. Boasting stunning views over the Swale Valley and a delightful lawned garden, this characterful cottage shouldn’t go missed. After a day exploring the delights of the Yorkshire Dales or the North York Moors, nothing beats relaxing in the large outdoor hot tub whilst taking in the fantastic surroundings. A superb base for exploring Swaledale, the Yorkshire Dales National Park and the North York Moors, making York House an ideal location for touring this wonderful area. Hudswell is a small ribbon village sitting on top of the valley above the River Swale, located just two miles from its better-known neighbour of Richmond. Set in delightful rolling countryside, the village boasts a mixture of lovely old houses and an interesting local pub. Like many village pubs, it recently fell on difficult times, so the villagers clubbed together and now run it as a ’Community Pub Initiative’. Discover the ancient market town of Richmond, which stands to the north of the River Swale. Its cobbled streets, narrow alleys and architecture embody nine centuries of history and unique character. The town grew up around its castle, and today there are wonderful walks to be enjoyed by the castle or alongside the River Swale. York House is ideal for those seeking a comfortable and relaxing holiday and offers a perfect base for exploring all of North Yorkshire including the Heritage Coastline and the medieval city of York. There are historic sites to visit at Rievaulx and Fountains Abbey, stately homes at Nunnington Hall, Castle Howard, and numerous quaint villages with traditional inns serving good food and local ales. Family fun can be found at Flamingo Land, Lightwater Valley Theme Park and Go Ape in the Dalby Forest. You can find miles of sandy beaches at the coastal resorts of Scarborough, Whitby and Filey. The shop, pub and restaurant are 300 yards from York House near Richmond. Ground Floor: Living room: With wood burner, 37 Freeview TV, DVD player, CD player and beams. Kitchen/dining room: With electric oven, electric hob, combi microwave/oven/grill, fridge/freezer, dishwasher, beams and wooden floor. First Floor: Bedroom 2: With zip and link super king-size bed (can be twin beds on request), 32 Freeview TV and en-suite with P-shaped bath, shower attachment and toilet. Oil central heating, electricity, bed linen, towels and Wi-Fi included. Initial logs for wood burner included. Travel cot, highchair and stairgate available on request. Large enclosed lawned garden with sitting-out area, garden furniture and barbeque. Hot tub for 10 (private). Bike store available on request. Private parking for 8 cars. No smoking. Holidays at York House run from Friday to Friday. Pets allowed at York House. For a better idea of where York House is, you can see York House on the map below. York House is in North Yorkshire; should you be on the lookout for a special offer, you can find all the special offers in North Yorkshire. It's always worth checking to see what is on offer at the moment. Do you want to holiday near York House (UK2183), you can see other cottages within 25 miles of York House; have a look to find your perfect holiday location.